Amazing story. As for comments, There is nothing that I can say which hasn't been already said. I really enjoyed your choice of words and flow. Not all stories sound good when read out loud but your was wonderful. The type of story that should be read during an "open mic". Thank you so much, Corine, I really appreciate your feedback! A rabbit taking over? It really is an interesting idea, and I really think that you did a great job writing this. I can see how tough this might have been. I personally think that no creature can exceed human powers, and till the end nobody shall get strong enough to be in a position to defeat them, let alone taking over! 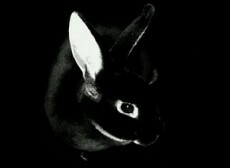 The nuclear explosion destroys all living creatures, and a few rabbits seem to have survived, planning to take control? Won't the remaining humans take over again? Or has everything turned up side down? A great story of destruction and retribution Oleg. I think all those who own a lucky rabbits paw better watch out! Thank you so much for your feedback, Mr. Watson! This was a very good story, I really enjoyed that. Excellent piece. I'm leaning towards feeling sorry for Coney and Albus who were thrust into sentience unwittingly. Now they genuinely face the struggles humanity have faced through the ages - will they do any better? One can only hope. Thank you so much for your kind feedback, Megan! Faith, hope and love. Those are some big words to use, Oleg. Very thought-provoking.... I suppose you don't realise how little meaning your existence might be until you are suddenly elevated higher as these rabbits were (although I can't help wondering what that might mean for humans, very self-important that we can tend to be)! As usual, a very enjoyable short story! As for grammar and that, the only thing I really noticed was 'Coney!..' where I think the exclamation goes at the end. This is one of your first stories I've read (very first, I think). And I enjoyed it. The lessons and suspense at the end were nicely thought of. The story flow and the animal's perspective were also highlights. Nice. Interesting writing about the end of humanity, the carelessness of our race leading to a nuclear assault. To tell the story from the point of view of the new dominant race, the bunnies, make it somehow more fantastic. It’s funny to imagine these giant bunnies talking to each other about what they will do as the new dominant race. In the last part, they make the rights questions, and don’t have the right answers cause the future is too unpredictable. The story develops paragraph after paragraph in a very logical way. There are some sophisticated descriptions, but the storyline is never lost. I like the ending; philosophical talk has no secret for you. I like the way you always do it. With style. Not my favorite, but consistent.